Spaulding Youth Center is pleased to announce Tilton, New Hampshire Chief of Police, Robert (Bob) Cormier, has joined its board of directors. Chief Cormier is a 36-year veteran of law enforcement. In 1982, he graduated from the Metropolitan Police Academy in Boston, Massachusetts. He has also worked in the Woburn, Massachusetts Police Department and was a member of the MBTA Police Department Special Operations Team. Chief Cormier also worked at the Los Angeles Police Department, where his divisions included the 77th Street Division, Hollywood Division, Foothill Division, Devonshire Division, Oakwood Task Force Pacific Division and LAPD Vice Unit. 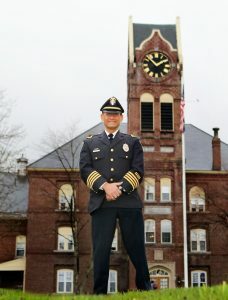 In New Hampshire, Chief Cormier served as Supervisor at the Plymouth Police Department and has been the Chief of the Tilton Police Department for the past 11 years. Chief Cormier is actively involved with Special Olympics New Hampshire, where he served as the NH Law Enforcement Torch Run Director. It was at a Special Olympics event where he first learned about Spaulding Youth Center and met students and staff members. He became more familiar with the organization after attending its annual Thanksgiving Luncheon, where he enjoyed interacting with Spaulding students and learning more about how staff and supporters work together to provide a safe and loving community. With his history of having a strong passion for helping children with intellectual and physical disabilities, Chief Cormier was asked to join the Spaulding board of directors. In this role, he hopes to help students become more involved and engaged in the community and vice versa by focusing on community relations and development. Chief Cormier is a graduate of the 245th Session of the FBI National Academy, FBI LEEDA Command Institute and member of the National Academy Associates and the FBI Law Enforcement Executives Development Association. He is also a past president of the New Hampshire Chiefs of Police, a vice president of the New England Chiefs of Police, and member of the IACP Patrol Tactics Committee. Chief Cormier graduated from Boston State College School of Law Enforcement and Northeastern University School of Criminal Justice. Chief Cormier also recently completed Southern New Hampshire University’s Leadership in Public Administration Program, a 12-credit master-level program for public administration leaders. The Spaulding Youth Center board of directors is comprised of volunteers from the human services, corporate, investment, and philanthropic sectors of our state. To learn more about the Spaulding Youth Center board of directors, visit https://www.spauldingyouthcenter.org/about-us/leadership/.